Bocage's Weaver was initially considered a subspecies of Cape Weaver, due to the similarity of these two species. The populations are widely separated, and Bocage's Weaver is found in central Angola, the southern DRC and north-western Zambia. It is colonial and lays blue eggs but otherwise is little known. The first PHOWN record for Bocage's Weaver has been submitted by bird ringer, bird guide and artist Rory McDougall, who attended the ringing course on Bovu island recently. Rory's photos were taken before he knew about PHOWN but he has been back to the Luakera river recently. Rory said: "On this last trip I did on 16th April 2012, I again re visited the site very late in the evening, No birds seen or sign of old nests as water was very high and access very difficult." 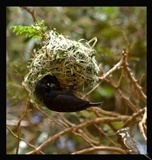 Rory will keep a look out for Bocage's Weaver nests on future trips to the area. See the Bocage's Weaver record VM 2371. Many new weaver species have been added to PHOWN in recent weeks, and there are now 51 species represented in the PHOWN database (out of 117 species)!